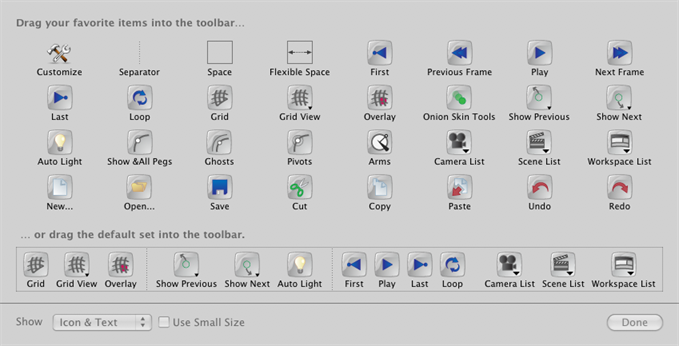 The Toon Boom Studio user interface contains toolbars which, by default, are located at the top or side of the interface. You can reposition the toolbars to suit your work style or hide unused ones. 1. Select Window > Toolbar > the desired toolbar. 1. Select the toolbar you want to move by clicking on its anchor point and dragging it to another position in the top or side interface toolbar area. On Mac OS X, you can customize toolbars to display buttons that access the commands that you use the most. 1. Select View > Customize Toolbar. A window opens displaying all of the buttons available for the view you are currently working in. 2. Drag the buttons you want to the toolbar in the current view. 4. By default, the Studio displays large buttons. You can enable the Use Small Icon option to switch to smaller buttons. 5. When you are finished making changes, click Done. 6. To remove buttons, drag them away from the toolbar.